I'm always thrilled to see entrepreneurs on the scene so I am so pleased to present you with Rosalyn's Scent. Cassandra, the owner of Rosalyn's Scent, has created a medley of products for your body, ranging from thick body butters to body fragrances. I should also mention that the prices are recession friendly! What could be more recession friendly than winning a full size product and all you would have to pay is the $4.95 shipping price tag. Each month you have a chance to win one of her free goodies- check it out here. When I first tried her products I immediately fell in love with the Mango scented body butter. I literally had to stop using it so that I could take a picture of it instead of showing you all an empty container. 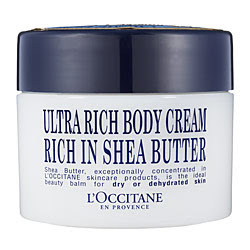 Surprisingly, the butter wasn't too thick for this summer weather, but I could also see myself using it in the winter to avoid having dry skin. Next up is the creamy coconut body cream which has the consistency of custard, I'm getting hungry just thinking about it. All of her products include natural ingredients like shea butter and essential oils, so you know that just tickled my heart. Many of you are fragrance addicts, you need spritzers, perfumes and body splashes in all of your purses, just in case. Well Rosalyn Scents also offers delicious fragrances in a roll on tube which is easy enough to pack in the smallest clutch purse. Right at this very moment she is offering scents for $1.50 because she has decided to discontinue certain fragrances. For 1.50, you just can't go wrong, so get it while supplies last. Check out the closeout fragrances here. There are so many different scents to try so I am very excited, but I believe the banana crumble body butter is next on my list. We are all different and we can appreciate different scents, so what really caught my eye is the fact that Rosalyn's Scent can provide you with CUSTOM SCENTS. Can you imagine having your own signature scent....I love that idea. Hi Everyone my post from yesterday is below this post. I thought I clicked publish yesterday but apparently I selected "save" sigh...rushing never helps. I hope you all are well....thanks for reading/watching. What do you all think of Whitney Houston's comeback? Despite the fact that I look cross eyed, the point of the picture above is to show that I am trying to slowly introduce bright colors into my beauty arsenal. I purchased an emerald green eyeliner by Stila. I must say forget about MAC, or Laura Mercer, which I posted on recently, because the Stila eyeliner is the softest I have ever used. Believe me when I tell you this little $19.00 gem just glided ever so softly across my bottom lids. And don't be fooled by the soft applicat ion, regular soap and water can not easily remove this liner. This is truly a keeper!!!!! What eyeliner colors are you using? Does the white eye liner actually make your eyes look wider?